My Creative View: A busy post! I have so many ideas swirling in my head and have had no time lately to do anything with them. The photos are printed and laid out, but that is as far as I have gotten. Until today! Yippee! There are lots of things I like about my LO. First of all, I used supplies that I don't ordinarily use, including the photos. I won a challenge at Club CK, sponsored by Scrapbooking From the Inside Out. I received a kit from them as the prize. Everything on the LO is from the kit, except the twine. 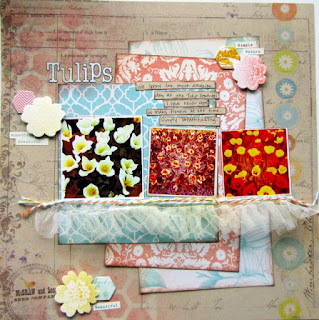 Tulle, PP by PinkPaislee, and Memory Box, Resist fabric flowers, PinkPaislee hexagon chipboard pieces. Second, I used the Hipstamatic app on my phone to take the photos. Totally cool! These have a more 70's feel. There is a different cast to them that I really like and went well with the PP. None of which is my style. It was really fun to try something so completely not me. I finished a LO that I am entering in two challenges. 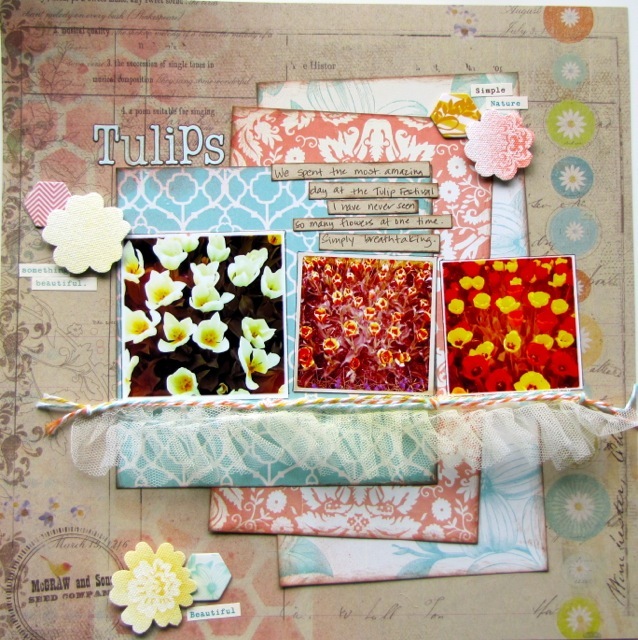 I participated in Diana Fisher's Blogiversay Blog Hop last weekend. I really like the sketch that the hop was based on. In Diana's sketch, I flipped it, omitted the 1/2 circle, moved the journaling and moved around some embellies. I also chose to use the tulle in place of the chevron looking border. I also am submitting this to Frosted Designs Fabulous Friday-Hexagons challenge. Two birds. One stone. Gotta love. I took the negative space from the chipboard embellishments and used it as a mask for some Tattered Angels Mist. Hexagons remind me of honeycomb and bees. Bees like flowers. You get the idea. Lastly, you need to check out two of my friends' blogs. 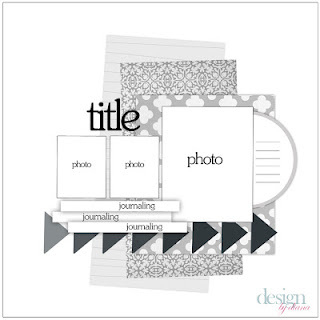 They are having a great giveaway of a new CK Special Issue -Simple Scrapbooking! ooh, very pretty!! love the tulle and your color choices- beautiful page! Great take on the sketch, love you layout!! Thanks for playing along with us at Frosted Designs!